Ripley’s Believe It Or Not Museum is one of the rarest and oddest attractions in Branson that gives visitors the opportunity to see incredible and odd things, artifacts, and unusual collections. This rare attraction displays an array of unusual and strange items that will mystify visitors of all ages. There are countless of bizarre items that are displayed in the museum that visitors will find it odd and amusing. This amazing museum in Branson features a unique collections of 30,000 artifacts, 100,000 cartoon panels, and 20,000 photographs. Robert Ripley, who founded the Orlando, Florida-based Ripley Entertainment Inc., started this museum in Branson which featured unique items so unusual that visitors will always find it amusing and interesting. Ripley Entertainment boasts about 80 attractions worldwide that attract about 12 million visitors each year. Ripley originally developed Champs and Chumps (a cartoon that featured sports) that was premiered on December 19, 1918 at the New York Globe. In October 1919, the title was changed to Believe It Or Not and from there Ripley started adding items that were not related to sports. It was in the early part of the 20th century that Robert Ripley became a world famous cartoonist and artist. When sports cartoon “Believe It Or Not” was created by Robert Ripley and later became extremely popular, it gave him the opportunity to travel all over the world. While he travelled around the world, he would always look for some odd things that he can add to his collections. The bizarre and odd cracked building that you can see around the museum in Branson is one of his odd creations. 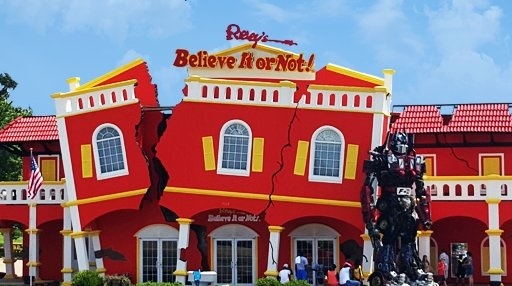 This amazing cracked building is one of the rarest and oddest attractions of the Ripley’s Believe It Or Not Museum in Branson. The building is a reflection of an earthquake that happened in 1812 which measured 8.0 on the Richter Scale. The intensity of the earthquake made the bells ring in one of the churches in Philadelphia. The earthquake was the worst to hit the US that time and surpassed the earthquake that hit California on the last few decades of the 20th century. This odd cracked building is one of the most photographed attractions in the world. The recent renovation of the museum in Branson have added rare and odd attractions. There are over unbelievable artifacts, world records, amazing illusions, franks of nature, awesome art works, and cool interactives that have now crammed the museum. There are also new additions in the odditorium that include a pair of horses made from welded horseshoes and a full size stage coach made of 1.5 million toothpicks. You will also find African fantasy coffins and the wacky “spinning vortex” tunnel that are some of the rarest attractions not to be missed. So, if you want to see many captivating displays of some of the unusual and oddest attractions that will make you gasp and wonder with its unique oddities, visit the Ripley’s Believe It or Not Museum in Branson.